Delaware guard Darian Bryant scored a career-high 18 points against Chestnut Hill College. 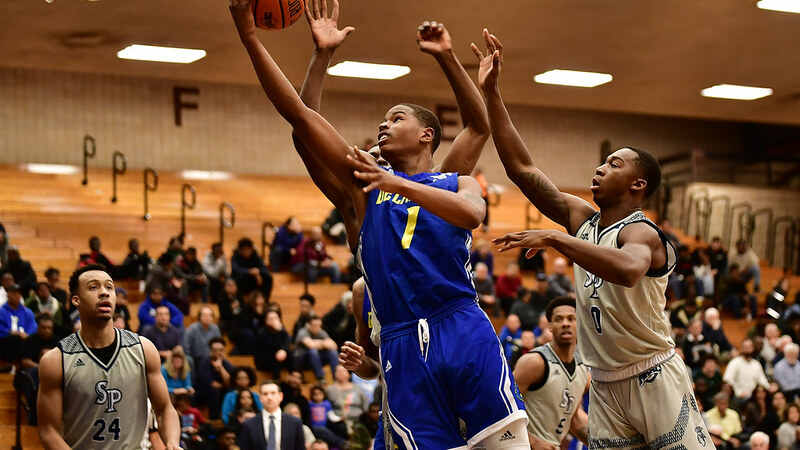 Delaware dominated all facets of its Tuesday night matchup against Division II Chestnut Hill College en route to a 100-62 victory. Delaware (2-1) scored 100 points for the first time since its 108-point overtime performance against Bryant on Dec. 21 2013. The Blue Hens had five players score in double digits, including redshirt senior guard Darian Bryant, who posted a career-high 18 points. Delaware shot 54.7 percent (35-64) from the field and 44.0 percent (11-25) from three point range. It was the first home game of the season for the Blue Hens. After a road contest at Cornell in Ithaca, N.Y., Thursday, Delaware returns to the Bob Carpenter Center Sunday for a matchup against Wilmington University, another Division II squad. Below is a player-by-player look at Delaware’s performance. Each player is given a grade on a scale of one to five stars, relative to their level of expectation. The grades are unscientific and an entirely subjective measure, designed to give a glimpse into how each player is performing game-to-game. Bryant got going late in the first half when Delaware went to a small five-out lineup with Bryant, Kevin Anderson, Ithiel Horton, Ryan Johnson and Jacob Cushing. He had three makes from beyond the arc and finished through contact in transition for a traditional three-point play before halftime. Bryant made a few mistakes defensively, but was a decisive shooter and gave Delaware’s offense another option outside of Anderson and Eric Carter. He finished 6-9 from the field and 3-4 from three. Bryant hit the game-winning shot against James Madison last season in a 13-point performance (he was five for six shooting) late in February, but in terms of raw numbers, this was the best game of Bryant’s career, especially considering that his career-best 18 points came in only 26 minutes. Carter turned in another solid performance. He overpowered Chestnut Hill forward Keyon Butler early and ran the floor for a few easy opportunities at the rim. Chestnut Hill took a physical approach to defending Carter in the post, and for a time did a nice job of denying the post entry pass, but eventually Carter worked through the contact to get his. Carter drew five fouls in the game and continued a strong start to the season at the free throw line. He’s shooting 73.9 percent (17-23), well above his career average of 64.6 percent. Carter only played seven minutes in the second half with victory well in hand for the Blue Hens. Anderson scored nine of his 13 points in five minutes of play in the second half. He created a few nice looks for himself off the dribble and off putbacks. Three of Anderson’s boards came off the offensive glass, including one in the second half that he rebounded and shot in one motion amidst traffic. After landing and drawing a foul to make it a three-point play, Anderson flexed to the student section. It was emblematic of Delaware’s commanding victory. Anderson also made a nice play coming off a Matt Veretto screen in the second half and spurred multiple fast-break opportunities. After a Blue Hens turnover, Anderson poked the ball out from Chestnut Hill’s ball handler directly into the hands of Johnson. The takeaway led to two Bryant free throws at the other end. Early on, he attacked a loose ball, which also got Delaware an easy break away bucket. Anderson didn’t attempt any jump shots, but Tuesday he didn’t need that part of his game. The sophomore guard was all over the floor and continues to improve with each performance. He, like Carter, was the beneficiary of Delaware’s massive lead. getting a long second-half blow. Johnson had a quiet game compared to his counterparts in the backcourt, Bryant and Anderson, but accumulated his best stat line of the season. His five assists led the team. He was able to play in a variety of lineups, starting alongside Carter and Collin Goss, but also playing when Delaware went small with Cushing or Veretto. His best play of the game was a smooth stepback three in the early part of the second half. A few times Johnson hesitated on open looks from three. He played solid defensively. Tuesday marked the second double-digit scoring performance of Cushing’s career. As a freshman, he posted 19 points in 36 minutes against Elon in January on 6-15 shooting and 3-12 shooting from three. Tuesday, he was far more efficient, hitting four of his nine attempts from the field and three of seven from beyond the arc. On the season, Cushing is 8-13 from three-point range. It’s obviously a small sample size, but it’s clear Cushing is trying to carve out a role as a stretch three-point shooting four. His 13 attempts have come almost solely from the corners. He put the ball on the floor more than usual against Chestnut Hill and a few times tried to do a little too much, leading to a team-high four turnovers. But it was another solid performance off the bench for Cushing. Veretto once again played the majority of his minutes with the bulk of the starting unit. He was the first man off the bench in the second half for Head Coach Martin Ingelsby. Veretto struggled keeping up with the up-and-down pace of the early portion of the first half (he’s not the quickest guy on Delaware’s team), but was a menace on the glass, pulling down a team-best four offensive rebounds and eight rebounds overall for the second straight game. He hit three of eight shots from the field and one of his four three-point attempts. Veretto even showed off some ups with a dunk on a fastbreak. Horton, like Veretto, rose above the rim, but only after his first dunk attempt went terribly wrong. With a clear lane to the basket, Horton tried to reprise the one-handed slam he threw down in Delaware’s season-opener at Maryland and was rejected by the rim. A few moments later, he recovered with a successful dunk, but his teammates certainly won’t let him off the hook for the humbling mishap. Horton missed a point-blank layup and was just two of seven from the field, but overall turned in a solid effort in a good chunk of Delaware’s blowout win. Long played extended minutes for the first time against Chestnut Hill. As a walk-on, he’s not likely to figure into Ingelsby’s rotation over the course of the season, but that’s not to say it’s unprecedented for a walk-on to see time. Just a few years ago, Curtis McRoy was playing meaningful minutes in CAA play. Long dropped a three on one of his first possessions, much to the delight of Delaware’s bench. He hit three of four shots and both of his looks from three. Goss played a good game defensively but didn’t have many opportunities to contribute on offense. He helped Delaware control the rebounding battle, 48-41. He was one of the only Delaware players who didn’t stand out in at least one sequence. The Sanford-grad saw a few minutes in garbage time. When he and Curtis Lochner enter the game, things have either gone really well or really poorly for the Blue Hens. Kevin Anderson led the way in overtime, scoring 10 points in the extra period. 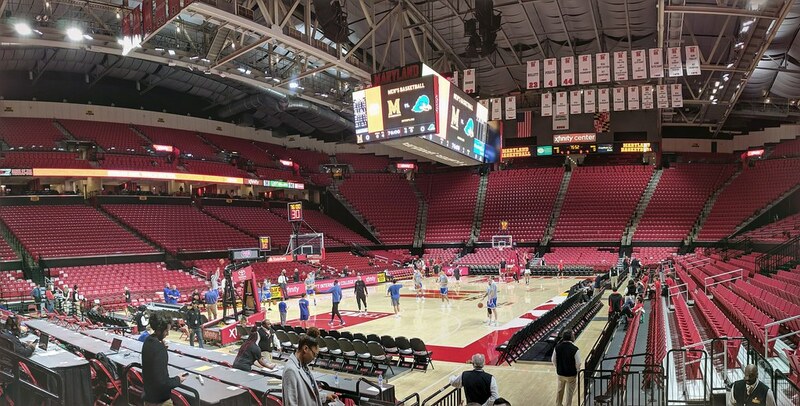 A look at Delaware's comeback effort that fell short against Maryland in College Park.